Astronauts Stephanie Wilson, Karen Nyberg and Rick Mastracchio (left to right) test the docking hatch on a mock-up of the Orion space capsule. NASA's Orion capsule could help astronauts on their way to Mars and other space locations someday. This week, a group of ground-based astronauts demonstrated the kind of testing that Orion is undergoing before it ever carries crewmembers into space. In a short video released by the space agency, three NASA astronauts are shown testing the docking hatch — which would connect the capsule to a larger vehicle in space — on a mock-up version of Orion. The test will demonstrate how the hatch functions during an emergency situation. "Today we're practicing an emergency escape as if we landed in the ocean and we can't use the side hatch because of large waves," NASA astronaut Rick Mastracchio said in the video. "So we're practicing egressing out the top of the docking hatch today." The Orion mock-up is located at NASA's Johnson Space Center in Houston. Mastracchio was joined in the testing by astronauts Stephanie Wilson and Karen Nyberg. The Orion spacecraft can carry two to six crewmembers at a time. 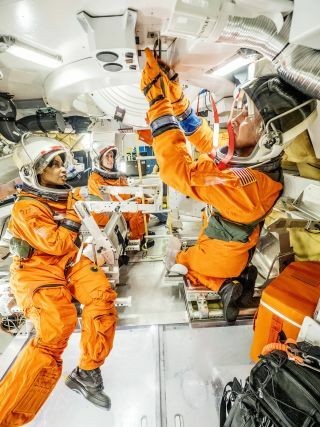 The video shows that the quarters aboard Orion are somewhat cramped, and astronauts are intended to stay in the vehicle for only short periods of time. A journey to Mars would require a much larger vehicle for the crew during what could be a nine-month ride to the Red Planet. In 2018, NASA plans to make the first test launch of the SLS rocket. During that test, the rocket will send the uncrewed Orion on a trip to the vicinity of the moon.